Back on 7 January Kent Lundberg posted a comprehensive review of Jeff Speck’s ‘Walkable City’ a most companionable book which manages to be highly informative and highly entertaining at the same time. 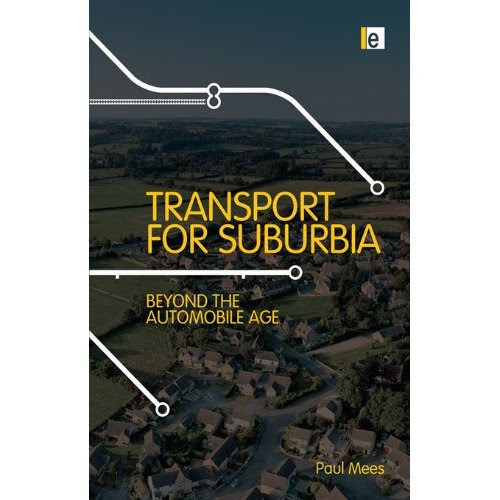 If you were influenced in any way by Kent’s review and read ‘Walkable City’ it is now time to read ‘Transport for Suburbia’ by the recently deceased Australian Paul Mees. This book is especially valuable because it doesn’t just deal with far away American cities. The early part of the book reviews in some detail, why and how our Auckland allowed its existing comprehensive public transport to utterly collapse. The author relates how strong opposition from Professor Kenneth Cumberland with his dual role as head of Geography at Auckland University and Chairman of the Auckland City Council Town Planning Committee, and from the long serving City Engineer at that time A. J. Dickson, clandestinely scuppered the railway tunnel proposal of the day championed by Dove Myer Robinson, to focus on motorway provision for motor cars. This was especially interesting for me personally because as a boy in Remuera in my parent’s house, we lived only seven houses away from those recent arrivals from Yorkshire – the Cumberlands! Needless to say, I didn’t know about and wasn’t interested in the issue, at that time. The book however does much more than deal with what went wrong in Auckland. For instance, Zurich where the initial challenges were quite similar, but the eventful outcome very different, is explored in some depth. Toronto, Melbourne, Ottawa and Curitiba are also reviewed. The desirability of congestion for single occupant vehicles as a practical method of promoting transit. New transit technologies are less practical than 19th as rail, trams and buses. High densities are not required for successful urban rail. Markets sometimes fail. Deregulation is not the best – a public agency is necessary for strategic and tactical reasons but not necessarily at operational level – read the book for a definition of these three levels of activity. The need for pooling revenue through the agency even though the provision of services may for practical reason be contracted out to private operators. Five must read pages for cyclists – everything may not be as you believe. This is a major work. I believe that so many of our official decisions regarding transport are made by local and national politicians for the wrong reasons, undefined objectives or because they just don’t really understand what they are doing. And like bad architecture, citizens live with the outcome for a long time. The important thing about Paul Mees’ book is that he has done the research and then commented on it, in an unbiased and logical manner, with which it is easy to identify. Paul’s book sets out very clearly the way forward for Auckland in its elusive quest as the most desirable, mid-size city on the planet. And after reading it, I become ever more hopeful that if we make the right decisions now, the goal is certainly achievable. Transport for Suburbia’ is quite different in style from Jeff Speck’s ‘Walkable City’ but it is well written and easily read. It should be a mandatory read for every Auckland Councillor, every employee of NZTA and Auckland Transport, but most of all by those holders of the Transport purse strings John Key, Steven Joyce and Gerry Brownlee, who really need to make properly informed choices, about the most beneficial taxpayer monies expenditure, for Auckland and the nation. the problem is, the three you mention at the end have no interest in doing the best for Auckland or the nation. Does he offer any proof about Arthur Dickson being clandestine? I worked with both his sons and neither would ever have done a dishonest or sneaky thing so it seems unlikely their father would be any different. Of course conspiracies are much more saleable than simply noting that most of the ARA members were opposed to the plan (and it was the ARA that had prime responsibility for transport planning in Auckland. Or perhaps the author could have mentioned that neither Labour nor National actually wanted to pay for it. You could always try reading the book….? The plot looks a bit thin to me and his characterisation unrealistic! Yup, keep that old mind closed; wouldn’t want anything fresh creeping in. By fresh you must mean the revisionist history of how Auckland almost got a rail system that was promoted by a mayor one part of the region, indeed just one part of the Auckland Isthmus. But how that visionary was thwarted by those mean people who didnt want to pay. Lets face it Robbie didnt even get close, his main contribution to our region was to pollute the Manukau Harbour rather than the Waitemata, a goal he shared with Cumberland. Whatever; still can’t see how you can have a view on a book you haven’t read…. Yeah well I dont have an opinion on the rest of it just the bits covered in the review above and in particular the myth making around the former mayor of a quarter or less of Auckland and the ridiculous idea that we just missed out on rail. Yes, DMR was only mayor of Auckland. So how is that relevant? It was a good idea and should have been done. Robbie was elected twice on the promsie to implement rapid rail – the people of Auckland City certainly wanted it. It is more a perfect example of why the Super City should have happened 30 years ago. Have you read the biography on DMR (http://beattiesbookblog.blogspot.co.nz/2012/08/urban-legend-sir-dove-myer-robinson-by.html)? It makes it very clear that Labour was prepared to pay and it was the incoming National party that scuppered it. Not hard to believe of a party that has always been rural focussed. Why are you so determined that there was no plot or agenda to suppress rail in Auckland? How else do you explain that a city so well suited to rail doesnt have a well developed rail system? It isnt hard to believe at all. There is a agenda now to at least delay it, so why not back then? Are you of the opinion that the people of Auckland rose up and en masse demanded the destroying of the public transport system in the 1950s and the installation of a mono-modal transport system? Because you will struggle to find evidence for that. Yes he was the Mayor of Auckland City Council which was less than half the size of the last Auckland City which in turn only covered part of the region. I cant find the population of his area but I am guessing around 200,000. the other mayors were not fans and the ARA chairman was against as were most of the members. DMR was given more publicity than his due because the council area was called Auckland not because it was the most important or largest bit. Robbie was elected on a platform of getting the government to pay for rapid rail. not on a platform that he would make his voters pay. there is a huge difference. As for Labour supporting it, they promised to at the election in 1972 but failed to include it in any of their budgets or move the project forward in a tangible way. An empty promise by Norm Kirk which they reneged on. They lost in 1975 because they because the country was hit by the UK going into the EU and an oil shock caused by the Yom Kipur war and they lost their way. Typical mfwic; refuses to engage with anything that doesn’t agree with his world view. Maybe you should try a broader range of literature and news to gain perspective? Ok, apologies for the assumptions, hard to detect tone on the internet and you often come across as very dismissive of professional work. Rookie error on my part, too much calculus, too little fresh air. My recollection of Robbie’s Rapid Rail is pretty close to that of mfwic @5,42pm, the most important point being that Auckland City was tiny compared with today, and no way could AC ratepayers fund it. I can understand younger readers not being aware of the environment of the day, although there are some older ones who should/must know better. There’s one aspect that mfwic didn’t mention, which is technology. I was involved in some of the design work and costing (I was much younger then! ), and there were significant technological constraints. I don’t recall any politics being involved, although I probably wouldn’t have noticed anyway. One example is that power and communications cables were mostly “paper lead” – a very heavy, complex and expensive system. Jointing required hot lead poured from a ladle, with the cast iron joint box subsequently filled with pitch. Today power cables are HDPE with compressed joint ferrules and shrinkable sleeves, and comms is fibre. Gas was cast iron, often corroded away such that it was really just a horizontal hole in the ground (it worked because it was low pressure). Water and sewage reticulation was steel, concrete and even ceramic; today it’s PE (as is gas). This means that legacy plant is now simply abandoned and replaced with modern kit. I’m not sure whether TBMs existed – I hadn’t heard of them back then – but even directional drilling was in its infancy. I recall a “mole plough” driven by compressed air which was a total failure, but nonetheless led to the modern techniques of today. In short, it’s easy to assume political motivation exclusively when, while that may have been a component, the full range of issues went far deeper. It gives a very different view and places the blame squarely in the political sphere. Just because DMR was only Auckland City mayor doesnt mean he wasnt right or that rapid rail at the time wouldnt have been a good idea. As for technology, cities all over the world that were considerably poorer than Auckland/NZ were building electrified train systems with tunnels. As well as Melbourne: http://en.wikipedia.org/wiki/City_Loop. So it cant have been technically impossible. Sorry Goosoid but reading about him is a step too far for me. My reading list is already long and I know enough about him to not care. When I started at the old small Auckland City Council I worked with two women who remembered him. He was infamous for chasing young women round the desk metaphorically. While they could laugh about it later they didn’t find it funny at the time. He was a famous Mayor and they were young women in junior roles. Not sure where creep fits into the heroes and villains narrative people now want. Indeed Goosoid, let’s not forget that we pumped huge amounts of funds into the CMJ and motorway network at the time, doing cutting edge things with road building technology. The Newmarket viaduct was one of the first of it’s kind (as was the Grafton Bridge for that matter). They’d been digging urban rail tunnels in Europe for over a hundred years at the time, not exactly difficult stuff. mfwic – interesting you raise that because the book actually talks about the negative parts of DMR’s personality a lot . At the end of it, I certainly wouldnt say that DMR was a very nice man. He was as you say a terrible womanizer and didnt seem to have a very good relationship with his children – some of them were quoted as saying some pretty horrible things about him in the book. He also treated his wives really badly. Personally, I think he was a very objectionable man. However, the same charges could be aimed at men such as JFK, Churchill and many other great leaders. Hitler of course was a tea-totalling vegetarian and reportedly very faithful to Eva Braun. All I am saying is that being an objectionable person doesnt make someone wrong on political or technical matters. DMR did give us a world class (at the time) sewerage system and stopped the pumping of raw sewage into the Hauraki Gulf from Browns Island. I really recommend you read the book as it gives an important perspective on contemporary Auckland. As for funding, as we are finding out now, having popular opinion is not enough for political will. And without political will there is no funding. It was and still is a good idea. I am still wading through a biography of Thomas Jefferson and a much better one on Admiral Edward Pellew. DMR is someone I have never really had time for. The Browns Island thing was a bad idea but DMR replaced it with stinky ponds that emptied into the Manukau. I am sure the people of St Helliers loved it but it really was just shifting Auckland City’s problem onto others. My impression of him from the older people I worked with was he really was liked by people who were into the bellicose political style that gave the impression of strong leadership in the Muldoon or Joh Bjelke Peterson model. As for the funding issue, my view is if you can make the project efficient enough then not funding will be seen as a mistake rather than the other way round. I think we will get there with CRL provided people don’t try to build the monumental stations that plague many railway projects. Clapham Junction is pretty plain but it works better than Charing Cross. Money matters but when it is spent effectively then rail become fantastic. Who are the 3 folks ahead of me in the queue – want to bet they’ll be readers here? In the unlikely event there’s anyone with an Auckland library card, who wants to read this book, yet doesn’t read Transport Blog… boy are they going to be in for a treat when they finally stumble across it. Sorry, I’ve just about finished mine and will return it soon! Plenty of time from my point of view, I’ve just started reading Game of Thrones. In my mind there are three really important factors which are examined in Paul’s book. They are (1) creating an effective Public Transport agency, (2) the need for the agency to control overall finances,allowing the pooling of revenue to avoid endless disputes and permit cross subsidy that is essential to network planning but most of all (3) the need to take Public Transport seriously at both national and local level so that it is not treated merely as an adjunct to a car dominated environment. If the latter applies and public transport improvements are constantly undermined by expansion of the competing road system then no amount of effort or innovation will develop an optimal outcome. Our national and local politicians really must do much better! If you want a Public Transport Service then he is dead right at number 2. Problem is our government copied the UK (as usual) and set up a Public Transport Business where independent operators compete for the best bits then suffer to provide the lowest level of service they can at other times and on other routes in exchange for a meagre subsidy. To be more specific, we copied the model of the UK excluding London. The brits couldn’t bring themselves to risk deregulated and privatised transit operations in the capital, even at the height of Thatcherism. Luckily the PTOM is a big step back in the right direction. Nick R – Agreed. The model for the UK outside London works fine when the great bulk of services in an area, if not all of them, are commercial, and further assistance can be provided via a concessions card system like Supergold. Or, it works fine when the great bulk of services are contracted. Where it does not work is where you have a mixed regime, some commercial some not – very difficult to get to work, and impossible to get to work well. I just downloaded it from Amazon. So far (the first chapter) reads like a tree hugging Greenpeace activist high on crystal meth. Ill give you one quote “Walking and cycling are the only truly sustainable transport modes’. Trippy or what? The chapter on Sternenburg is equally crazy. Trying to compare a small hamlet in the outskirts of Zurich to Melbourne is ridiculous. Switzerland has an amazing PT system and an amazing autobahn network, they also have an amazing amount of wealth that Australia and NZ lack. Save your $77.00 for reading material that is more realistic than this guys book. Gerado – you are premature – read the whole and then comment! But Walking and Cycling ARE the only truly sustainable transport modes. All other modes generally rely on huge energy resources to construct and sustain. As for “Robbie’s rapid rail” – I once heard Jo Brosnahan explain it as follows (in 1976 she was a graduate in her first job, at Auckland City), that the National Government of the time pulled the plug on the idea “when the cost doubled in an afternoon”. Over the following years (1977-80) I was at high school and using the trains to commute in from where I lived … and it was painfully evident even then that the key need was to get a link through to Britomart, even if at that stage it would had been a simple four- or five-platform terminating station on the site of the old parking building. Wider electrification would not even have been on the agenda at that stage and Wellington’s red rattlers were still going strong. The point is that Robbie was trying to do too much, and a scaled approach would have been much more affordable and even fundable. During the 90s, when I was with Transit, something cheap and cheerful was very much the option, and only in the $20m or so league. However, no-one seemed to be interested. I worked on the cheap Britomart plan but it was scuppered by the Council’s property team who promoted a grandiose plan that included a huge carpark and tall office buildings to fund it. Then when the Council changed it was the expensive station with no carpark and no big offices to fund it. And hasn’t that worked out. Expensive sometimes means valuable. Cost discussed without balancing it with analysis of value is pointless. As Mr Wilde said, they know the price of everything and the value of nothing. So Britomart is a misstep?!? I don’t think you’ll many to agree with that, especially compared to the alternatives proposed, including doing nothing. Or is it that all public spending a ‘misstep? One of the 0.5% no society geniuses, then. There are two schools of thought in rail. One is you build monumental railway stations- the politicians love opening them and pointing at them as evidence of what the have achieved. the other school is you spoend your money on the system extending it and making it easier to use. A station just needs to be a safe place to wait. the council went the St Pancras way..